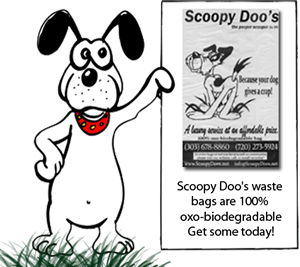 For over 25 years, Scoopy Doo’s has been providing the utmost in professional dog waste removal services for commercial, residential, and HOA clients in Erie, Frederick, Firestone, Boulder, Gunbarrel, Niwot, Longmont, and surrounding areas. Our small team of poop scoopers are friendly, reliable, and thorough and provide luxury pet services at prices that are very affordable. The team at Scoopy Doo’s has extensive experience with dogs of any age or breed. It is our goal to make your four-legged friend feel comfortable, so we take the time to befriend and get to know them so that they never feel threatened when we are performing our services. We strive to gain your pup’s trust and friendship. Our clientele consists of an extensive list of satisfied customers in Erie, Boulder, Longmont and the surrounding communities. Of those clients, our HOA and commercial clients greatly appreciate the fact that we take the time to remove all dog waste from the entire property, ensuring that all dog poop has been removed after every single visit. Since 1993, we have grown our business on personal referrals by satisfied customers, and as a result, have a $25 cash referral program for every new customer referred that results in new business. Scoopy Doo’s believes in customer satisfaction which is why we guarantee our services – 100% guaranteed! Don’t forget to check out our customer reviews page and our Google reviews. If you live in Erie or the surrounding areas and need the professional services of a poop scooper, call the trusted team at Scoopy Doo’s at 303-678-8860 today. We take care of your pup’s poop so you don’t have to!